Root tools are all the rage these days. It lets the Android devs put together a package to help people root and modify their phone who otherwise may not be able to go through and do all the adb commands or coding. 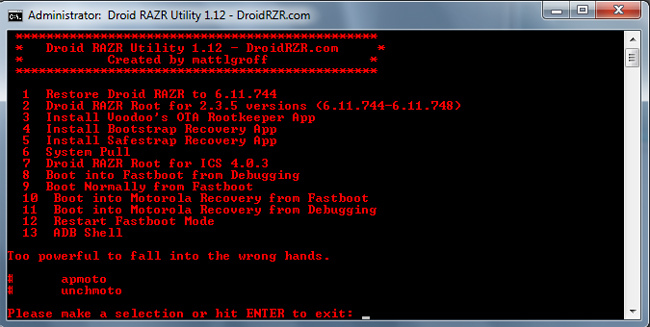 The latest that we have come across is a utility tool for the DROID RAZR. Released on XDA and only working on Windows for now, this tool allows you to do almost anything you can think of with your RAZR. Restoring a stock system image, installing the rootkepper app, and even rooting can all be done through this nifty little script. Head on over to XDA and download it if you are interested. This only works on Windows so far so be warned, and please make a backup before you do anything to your precious phone.